The E16 section from Sandvika to Wøyen forms part of the E16 Sandvika to Skaret road project. The zoning plan was approved in 2011. The planning work was performed by Aas-Jakobsen with assistance from companies within its network. The current E16, which was completed in the mid 1980s, is one of the country’s most congested dual carriageways. On the section between Sandvika and Bærumsveien, the existing E16 corridor makes it difficult to utilise land in an optimum way. The new corridor will open up Hamang at Sandvika for major urban development, and will allow large-scale residential development to take place in the Franzefoss area. The Wøyen to Bjørum section was completed as a four-lane motorway in 2009. 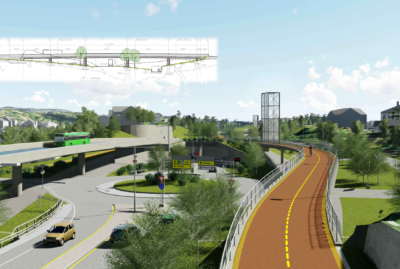 The completion of this section and eventually the Bjørum to Skaret section will provide a consistent standard of road and improved traffic safety between the E18 in Sandvika and Skaret in Hole municipality. Aas-Jakobsen is the lead consultant and client’s contractual party. Sub-consultants from the network will be used for disciplines other than civil and construction engineering and engineering management. The Bjørnegård Tunnel will be constructed as a twin bore tunnel, 9.5 cross-section, with a length of around 2.3 kilometres. Of this, around 500 metres will be a concrete tunnel, some of which will be built in extremely deep construction pits, braced with secant pile walls and special sheet pile walls made of pipe piles. 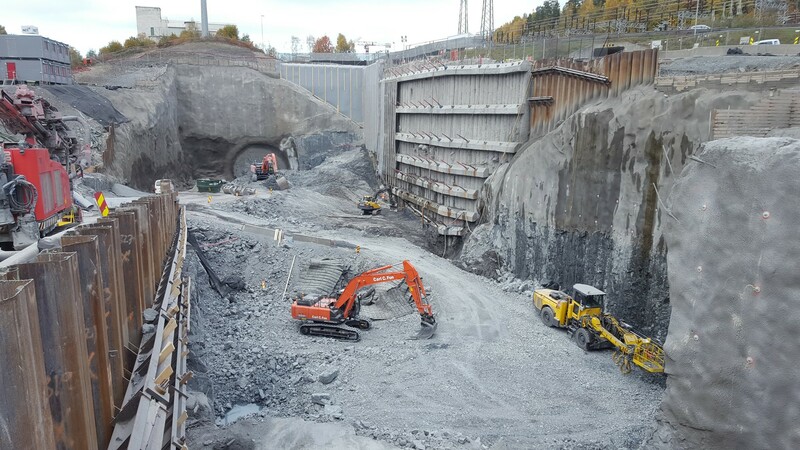 The connection zones in the south to the existing Kjørbo tunnels will be excavated using retaining walls and special drilling methods. The open-air section of E16 between Bærumsveien and the section boundary at Vøyenenga. The section is around 1.4 kilometres long. This short section contains two complete stack interchanges over the E16, the Bærumsvei interchange and Lommedals interchange. The section contains 7 small bridges/pedestrian and cycleway bridges and 8 large road bridges. 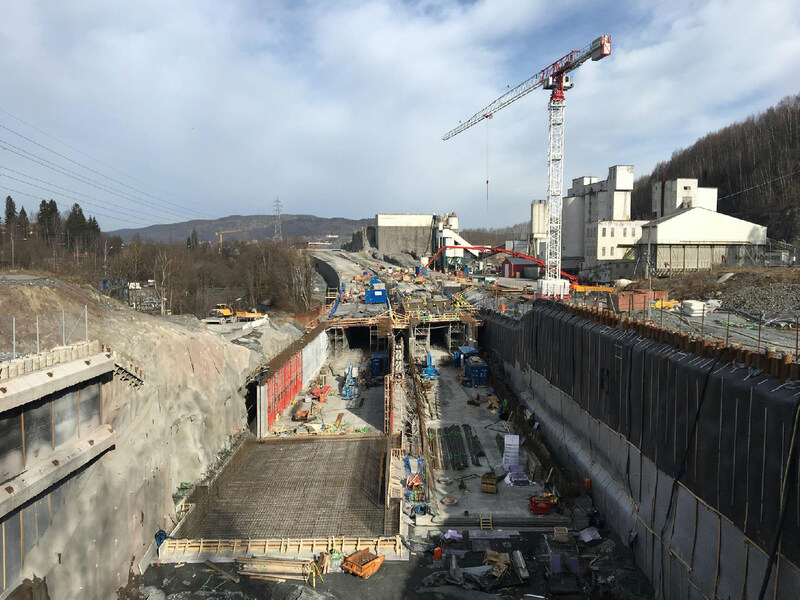 Because of particularly poor ground conditions, it has proved necessary to add in 4 lightweight embankments, around 18,000 m2 of piled concrete slab and around 3500 m2 of ground reinforcement with piles and pile caps for the ground under the road superstructure. From the Sandvik River and around 0.8 kilometres uphill along Bærumsveien, Dælibekken stream will be reopened. The existing E16 corridor will be demolished, including 5 road bridges. Brynsveien will be rebuilt with a new bridge over the Sandvik River, and a new Industriveien with intersections will be built. The current E16 between Brynsveien and Franzefoss will be modified to become a local road and bypass road in the event of tunnel closures. A new heavy vehicle checkpoint will be built at Økri, to replace the old checkpoint at Løxa. During the course of the project, the design team has solved a number of technical challenges which have been caused by difficult ground conditions and rock beds. At start-up, we had a list containing numerous points of uncertainty, and one by one these have been resolved. There is still some uncertainty relating to ground and rock conditions. The design team has also assisted the client on difficult issues concerning the rerouting of high-voltage cables (major overhead cables), adjacent properties, Statnett’s new transformer station and Court of Assessment cases. We have received excellent feedback on this work. As of autumn 2017, the status is that the construction work on both construction contracts is proceeding at full speed. The tender documentation for the local road system in Sandvika and up to Franzefoss still has to be prepared. Construction work on this contract is expected to start in spring 2019 at the earliest, with completion in the late autumn of 2020. There is still expected to be a good deal of supervisory work and assistance to the client until the permanent four-lane E16 is opened to traffic, which is scheduled to be in the autumn of 2019.
ca. 3,4 MNOK. ex. VAT.